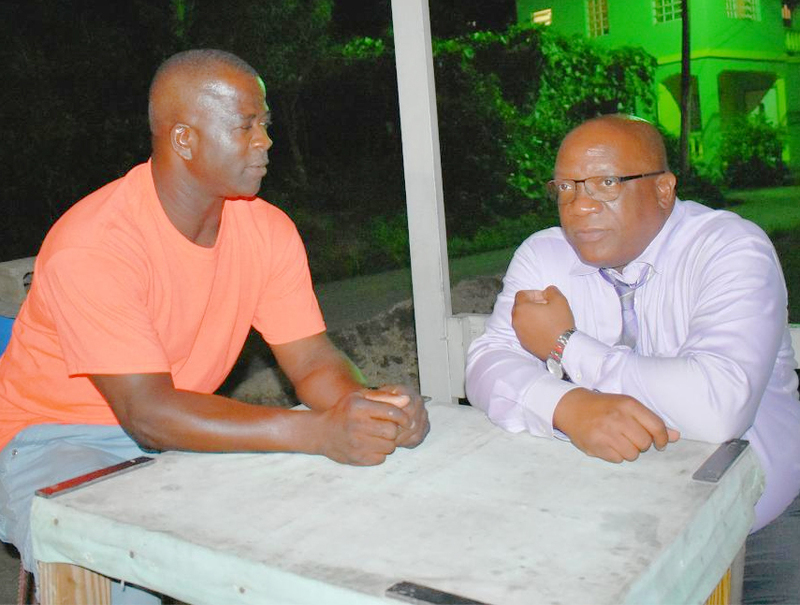 Prime Minister, Dr the Hon Timothy Harris (right), in conversation with Glenroy Woodley, who thanked him on behalf of 1,250 Government Auxiliary Employees. BASSETERRE, St. KITTS — Glenroy ‘Mac’ Woodley is probably the most outspoken Government Auxiliary Employee (GAE), formerly non-established worker. He has worked in that capacity for 20 years, and he does not shy away from speaking up for 1,250 fellow GAE’s. It is therefore not a coincidence that after Prime Minister, and Minister of Finance, Dr. the Hon Timothy Harris announced at his Nov. 14 monthly press conference that GAE’s will receive holiday pay in December, Woodley personally thanked the Prime Minister on behalf his fellow GAE’s. For a man who would have been disappointed in the past when the former government failed to honour its promise to the then non-established workers, this was a hot issue and Woodley did not want to wait until morning to thank the Prime Minister. Luck was on Woodley’s side. Although he does not live in Phillip’s Village, he was aware Prime Minister Harris, who is celebrating the 25th Anniversary of service as a parliamentarian, had a ‘meet and greet’ walk-through scheduled there. In addition to being a GAE, Woodley is on a committee formed last year to advise the government on all aspects of an anticipated implementation on legislative, financial, and human resources as it relates to GAE’s. The committee is chaired by the Chief Personnel Officer of the Government, Mrs. Torfrida Rochester. “I am really happy to see the Prime Minister has lived up to his word – that promise made, promise kept,” said Woodley, who later talked to Prime Minister Harris at PG’s Bar by the Bridge in Phillip’s. “He is celebrating twenty five years as a parliamentarian. The first incident I had with him, that makes me know he is a man of his word, is when he came to campaign first in 1993 I told him about the state of poor roads in Stone Castle in Tabernacle.